Some of the misinformation that exists out there regarding John Wilkes Booth’s death is the idea that the Booth family never identified his body. Conspiracy theorists use this incorrect idea to support their opinion that the man buried in the unmarked grave in the Booth family plot at Green Mount Cemetery is not Lincoln’s assassin. Like so much of the conspiracy theorists’ “evidence”, however, the truth easily dismisses the myths. The family did identify the body and they had no doubt in their minds as to who it was. In fact, during the time prior to Finis Bates’ conspiracy book about John St. Helen and David E. George, setting the record straight about the matter of identification didn’t even focus on John Wilkes. The following is a letter written by Edwina Booth Grossman, Edwin Booth’s daughter, to the editor of the Century Magazine, R. W. Gilder. In it, she requests that Gilder put something in print to set the record straight about which family member identified Wilkes’ remains. I find it humorous that, back then, the “controversy” was not about John Wilkes Booth’s body, but rather which Booth claimed him. May I ask you to kindly correct a statement which has recently appeared in print viz, that my father went to Washington to identify the body of his brother John Wilkes when it was disinterred from beneath the Arsenal. I once asked my father if he had seen his brother’s body and he emphatically replied that he had sent his brother Joseph on that ghastly errand. This may not be of sufficient importance to the public at large, but as it means much to me, I am naturally anxious that a correct version of the incident be published. My father also told me that he never set foot in Washington since the day he was summoned thither by the authorities and courteously detained but a short time while giving testimony under oath as to his ignorance or knowledge of his brother’s crime. That having satisfied his inquisitors he was allowed to return at once to his broken hearted mother and to his home in New York. That is all the information I ever sought from my father on this painful subject. I have never heard of the lady in question and wonder if she is still alive! Perhaps you can inform me? Also, back in 2000, this letter, along with the lock of Wilkes’ hair Edwina mentions, were sold at auction by Christie’s for $35,250. Has any DNA testing been done on the hair to match it with a Booth descendant? This could finally put the question of “who’s buried in Booth’s grave” to rest. From my extensive training from watching Forensic shows like CSI, I believe that getting DNA from hair requires the end of the hair follicle. The DNA would be in the small amount of tissue at the root of the hair. I don’t believe you can get viable DNA from a lock of hair that has been cut off without the root. Just remembered…I sent you an email last month regarding an eBay listing I came across a couple of years ago that I saved on my computer. 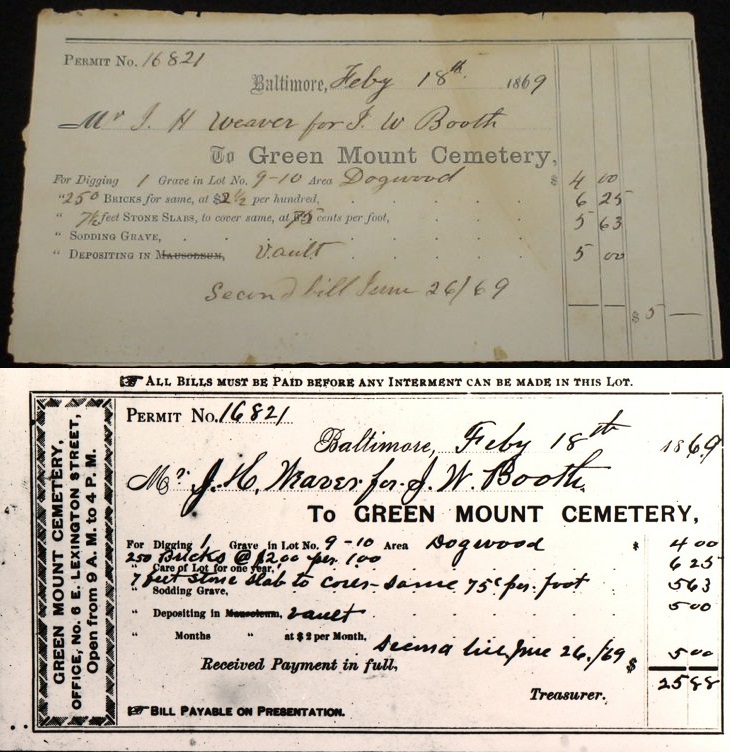 It was an ORIGINAL BILL SUBMITTED FOR BURYING JOHN WILKES BOOTH, 1869 at Green Mount Cemetery. Hope you saw it. Thanks for the reminder, Carolyn. OMG! I’m very familiar with that website, didn’t realize it had those images. Thank you Dave! Looking at it closely, the bill you sent from eBay and the one in the picture are not the same. I’ll post a picture in a second. These bills, though containing the same information, are different. I wonder if one was the cemetery’s copy and the other was for Weaver’s. Great detective work! Sorry I can’t answer that question. Wonder if Green Mount Cemetery would a copy on file? I cannot answer that question either but do want to say that whenever I am looking for images on the net, and google any name connected with the assassination something comes up connected with BoothieBarn. Congratulations Dave, you are all over the net! I agree Rich! This is my go-to guy for anything on the Booths. Dave has been extremely helpful and knowledgeable. Thank you Dave for your assistance to my inquiries. Carolyn & Dave, The second picture you have posted has an additional $5 added next to June 26/69. Was this the one placed for sale on EBay? In my notes on the top bill Dave has posted I have the following provenance: Al. Emmett Fostell Collection, Radford Sprague Collection (circa 1960’s). At a Heritage auction on November 2007 the item was not sold. Am I wrong or did I confuse the two? The top bill is the one that Carolyn spotted and copied from an eBay auction in 2011. I do not know the provenance of either one. I have seen the top bill before, and a copy of it may be in the Surratt holdings from either James O. Hall or John C. Brennan. The latter gentleman was on a first-name basis with every cemetery superintendent in America…or at least it seemed that way. I guess I never really looked at them too closely. It looks like the top one is the bill and the bottom the paid receipt. Could that be correct? Roger Norton has a fantastic website filled with great information.